Some wore suits or dresses. Others wore jeans and wool caps. Some were politicians, social service workers, police officers and Westporters who live in very comfortable homes. Others live at the Gillespie Center. Ushers from Homes With Hope showed down-on-their-luck folks to their seats. Clergy from 3 different congregations conducted the service. The 1st selectman gave a reading. So did a Westport police officer, who spent much of his own youth in shelters. 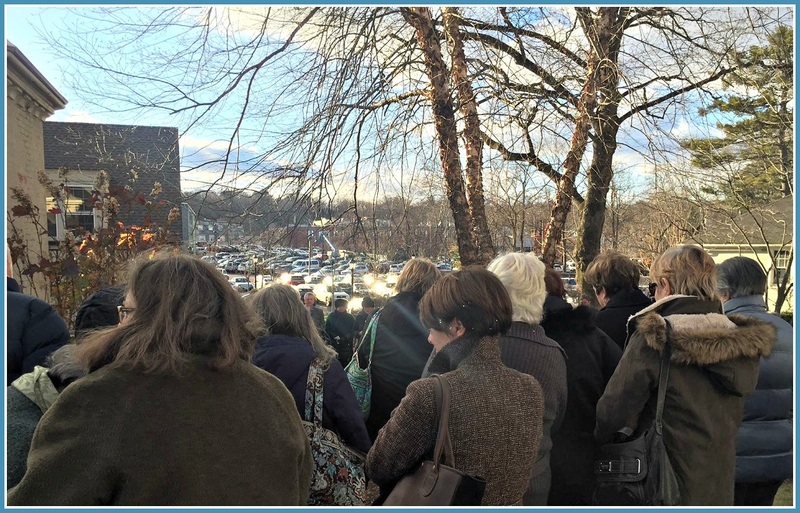 Over 150 people — some from as far away as Baltimore and Brattleboro — filled Christ & Holy Trinity Episcopal Church this afternoon, for a funeral service honoring a woman some never met. 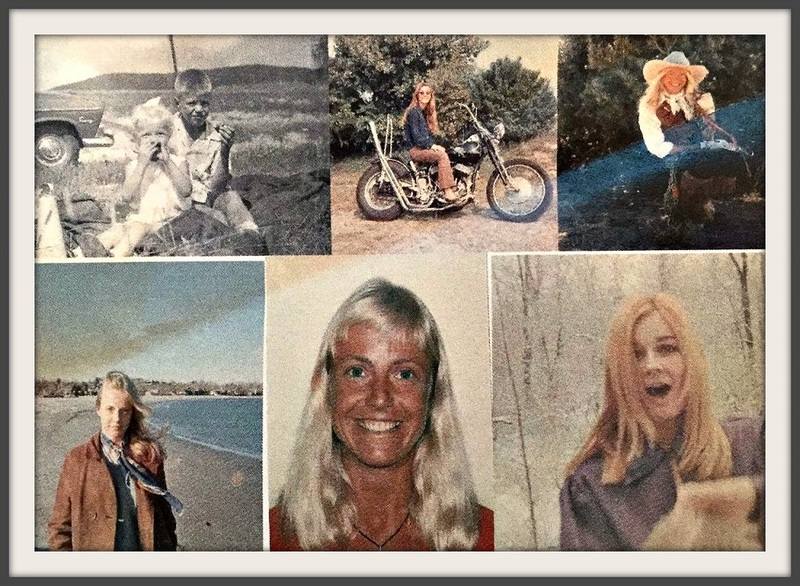 Tina Wessel died last month. A homeless woman with a pronounced limp, she was a longtime fixture in downtown Westport. In her life on the streets — and in the shed near the Senior Center where her body was found — she touched many hearts. They did indeed. As one woman related in remarks after the service, Tina had another remarkable side. An hour after receiving a donation of food, Tina knocked on the agency’s door. Photos of Tina Wessel, from the program today. Rev. Peter Powell — who founded and served as the first CEO of Homes With Hope — delivered a powerful, challenging sermon. “Tina touched many of us in ways that would probably surprise her,” he said. He noted that many of the readings at the service mentioned bringing bread to the hungry, and giving homes to the homeless. Rev. 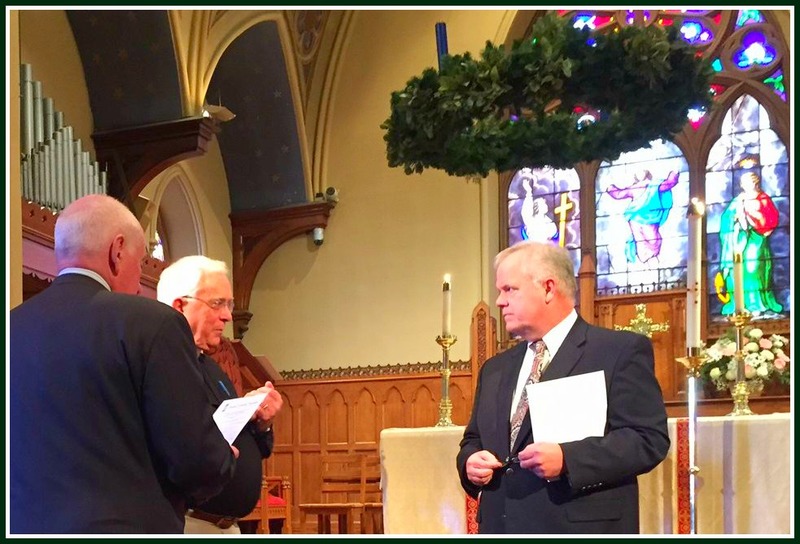 Peter Powell (center) before the funeral, flanked by 1st Selectman Jim Marpe and Rev. Jeffrey Ryder of Green’s Farms Congregational Church. He recalled similar Westporters whose funerals he officiated at — though one had only 3 mourners. He told their stories, and mentioned them all by name. They may have been homeless, but they were not faceless or nameless. The town of Westport, police and Homes With Hope tried to help, Rev. Powell continued. Westport — “an amazingly generous town” — does far more for its homeless citizens than virtually any other affluent suburb in the country. Tina did not accept some of that help. “Her reasons make no sense to you. But they did to her,” Rev. Powell explained. When the service ended, Tina’s ashes were honored outside, in the church courtyard. It’s in the midst of downtown, where she spent so much of the last years of her life. Mourners stood outside, as Tina’s ashes were honored in the heart of downtown. Then everyone — social service workers, police officers, Westporters in very comfortable homes, residents of the Gillespie Center, and anyone else who knew Tina (or wished they had) — gathered downstairs. They shared food and coffee together. Photos of Tina and her brother Ludy — when both were young — were displayed on a board in the church’s Branson Hall. This entry was posted in Organizations, People, Police, religion, Westport life and tagged Christ & Holy Trinity Episcopal Church, Homes With Hope, Jim Marpe, Tina Wessel, Westport Senior Center. Bookmark the permalink. Really nice job on the service. And thanks Dan for getting this story out there. Another great story Dan… working as a psychotherapist I have been honored to share the journeys of many people… few of us know even a fraction of the challenges people go thru in this life.. Tinas story reminds us to keep our eyes and our hearts open for those who may need a helping hand… a listening ear especially during these dark days of winter. From the pictures of her youth and even as a young lady, it appears Tina came from a well to do middle class upbringing. Does anyone know her story? Where did she grow up? Was she married? Children? I’m amazed at how many people showed up to honor her life. May she rest in peace…. What a lovely looking woman. Like Adam, I would like to know her history. Looks like she was on Compo Beach as a young woman. Is her brother also gone? Growing up in both Westport, and then Philly Main Line- I knew some Wessels. Wonder if there’s a connection. “There but for the grace of God go I.” Could be any of us. Yep, absolutely stunningly gorgeous. Please read on for my other reply. It was a deeply moving service. Your comment on Rev. Powell’s “powerful and challenging sermon” summed up my feelings perfectly. My hope is that others similarly affected by his words will get involved or continue to reach out to those needing help. Rest in peace Tina, rest in peace. I fully understand that some homeless people do not want to comply with the shelter policies .However sleeping rough in the cold is not the answer.Westport needs to set up a safe sanctuary where they can sleep.The Senior Center sheds should no longer be accessible.Westport is a generous community with a lot of good people who can surely put their heads together and find a solution.I knew Tina and tried to helpThe last time I saw her she needed another quarter for a small container of potato salad at Gold’sShe smiled and thanked me. There is a back story. Much of it is anecdotal. Much of it is tragically real. I knew her and Ludy from High School. 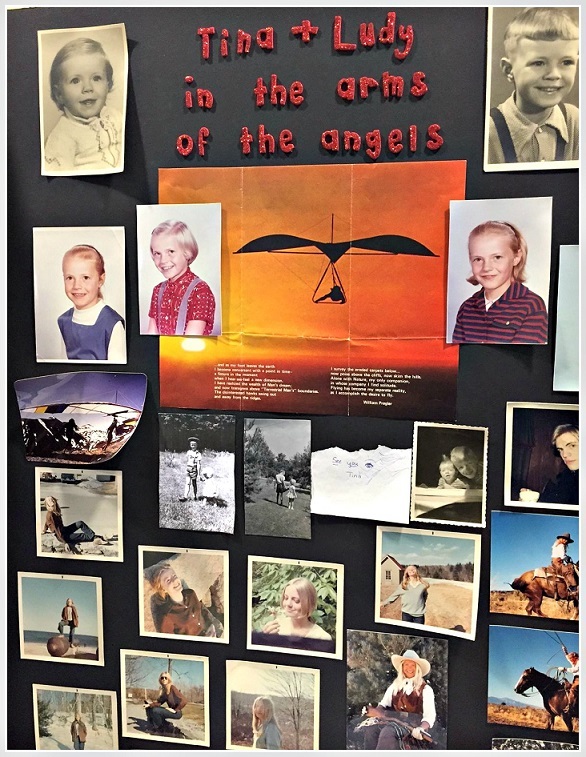 I put together that foam core display from photos which were found in her brother Ludy Wessel’s possession when he died a couple of few years ago. His landlord, Morgan was kind enough to give them to me and to another friend Wayne Whitehill. For sure, judging from the photo albums and the captions (written in German) her Mom, Dad, brother Ludy and she came from Germany around 1953 on an ocean liner. These photos and photo albums tell a chronological story. I intend to turn over all photos to Human Services at Westport Town Hall. Three weeks ago Tina was walking across Myrtle Avenue trying to stop someone…, anyone. I watched as I left WHS and saw not a single person comply (even open their window) with her knocking on their car fenders. It was appalling to me. In any case I inched up and when I got to her I rolled down my window and said “Tina, what do you need?” She said “I just need a ride down to CrossRoads” I said “OK, Hop in” and she did. as much as she was able. That day she was in a loquacious mood. We talked about her photographs from her childhood and from her more recent past and she was relieved to know I had them. She told me that she wished to return to Colorado. She said she had never been happier. In that short drive from Myrtle to CrossRoads Hardware, and during the 30 minute talk we had sitting in the parking lot, she and I came to an agreement. She asked me if I knew Margaret at Human Services which, thankfully I do, and Tina said,.. keep the photos and keep in touch with Margaret because she will be the person I will let know about my living situations. And now, so be it. I’m the owner of Winslow Park Animal Hospital. We had the opportunity to meet Tina many times as she was always crossing the post road daily in front of our hospital. Her mood definitely changed by day but she was always willing to say hello and even stopped in a few times. We will miss her. Thank you Dan for the article and everyone else that cared for her. More Social Workers, with better pay. More shelters given higher government, private and public funds. This universal problem is not going away but can be better recognized, addressed. Thanks for all these thoughts, here-especially Ellen Naftalin’s post. Like Adam and BJ, I would like to learn more about this woman. She was so pretty, apparently rode a motorcycle and rode horses. What happened? Did she marry and live in Westport? She was born in December of 1952. I was born in November of 1949. I am so grateful for my health and being able to survive as a self-employed proofreader in Wallingford. But what caused Tina to be homeless? What a sad ending to her life, living in a shed near the Senior Center. I thank all the people who tried to help her. I just wish more could have been done. 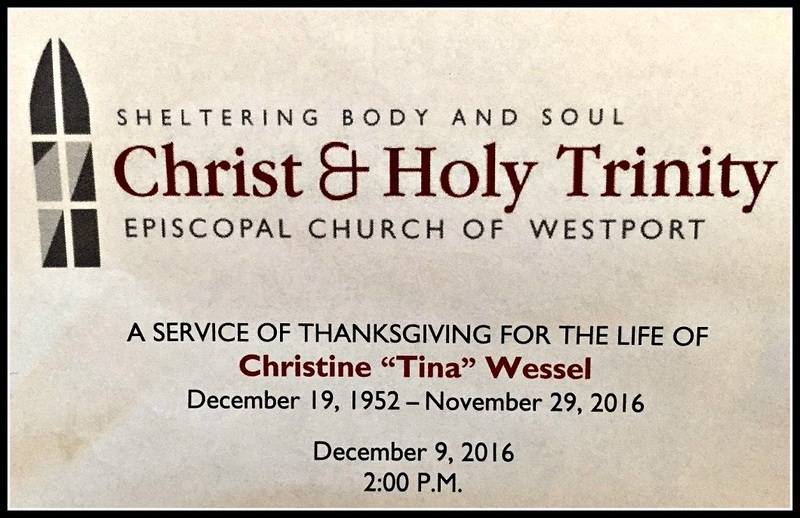 My condolences to the family of Tina Wessel. Ellen, thank you. For your kindness, compassion, and for being the one who stopped and said “hop in”. For being the one who took the time and made the effort to honor Tina’s life so beautifully. What an incredible person you are; I’m certain I’m not the only one whom you’ve inspired to be a better human being. And thank you to Dan Woog as well, for shining a bit of light on Tina’s story. Thanks Annikki, your comment is much appreciated. I never knew her name but often saw her washing her hands and face at 6:30am at an outside water spigot at the senior center when I would deliver Stew Leonard’s food donations. I asked her if she wanted a small treat but she was reluctant to take one from me… after all who would take “candy” from an “old man” at 6:30 in the morning outside and in the half-track???? ?From those first times, I began leaving one or two small treats by her borrowed shack below the Center. I never saw her take them, but I felt good knowing it may have helped. Yes, she did touch a lot of lives. There were many additional details on WestportNow this AM, for those who might have missed them as I had. Particularly concerning Tina’s family origins and circumstances while she was growing up among us. According to WN, her family situation and trauma were root caused by WWII and are particularly tragic. As a child growing up I was her age and Westport/Weston was a small, close knit community then and much of that warmth is still there judging be the emotions Tina’s death has evidenced. “Everybody knew everybody” and yet I remember nothing about her. I can’t imagine what life must have been like for her. Since leaving Westport I’ve seen that homelessness is pervasive in this country and is not abating yet we rarely are exposed to individual circumstances of homelessness. It saddens me to realize that this tragedy was occurring for many years right under our nose. Hard to believe that “no one” knew her and knew her story. Perhaps mental illness. Family trauma. The parents; what happened to them?